Planetary Administrator Leonalle Yvesk’s assistant, a much younger Gallente woman named Colasa, trotted up and matched his pace as he disembarked from the passenger tram. Yvesk sighed vocally. As they made their way up the ramp to street level, flowing along with the crowd of other laborers and urban professionals commuting to work during the morning hours, she remained silent. Only when they had emerged into the open and separated from the majority of the other pedestrians did she venture to initiate conversation. “Good morning,” she began. “I hope you’re well today.” She had a polite but submissive demeanor he usually appreciated. It had taken him almost fifty years to climb to his position as the highest authority on Chesiette Prime, the first planet of the Chesiette system, a thriving temperate world with just over a billion inhabitants. Because of its position near the border between the Gallente Federation and Amarr Empire, the planet was important – on paper. In reality, the efficiency of Federation politics, combined with their peace-oriented foreign policy, had rendered many of his duties unnecessary, resulting in his being regarded by many officials as a glorified middle manager instead of a frontier diplomat. “I have the report you asked for on carbon compound dispersion patterns on the southern continents.” She fumbled with a small case as they walked, almost colliding with several people moving in the opposite direction. Yvesk stopped abruptly and grabbed her arm, drawing a startled look from his young assistant. He glanced around and shot dirty looks at all the people watching, their attentions instantly focused on the two after the last word she had spoken aloud. “I think it would be best,” he hissed, “if we kept such topics in private discussion.” When he was certain that his point had been made, as was evident by the paleness of her face, he released her and stormed off. Nodding quickly, Colasa averted her eyes. From that point until they arrived at the conference building, she stayed a step behind the administrator, absolutely silent. Seated in the largest chair in the observation room, Yvesk took a few moments to make sure his suit’s collar was perfect before nodding to Colasa, who was seated at a nearby holographic interface. She ran one hand over the console’s horizontal sensor, prompting the air above it to waver and coalesce into a digital readout. Reaching up and tracing one finger across the insubstantial surface of the screen, she selected the proper communications channel and turned to look at the far wall, which went entirely black, save for the blinking symbol in one corner that indicated a connection was waiting for authorization. When an image finally appeared, it caught the administrator off guard. The capsuleer was clearly of Amarr descent, with high cheekbones and a clean-shaven scalp, but beyond the most obvious features, little of his face could be discerned. 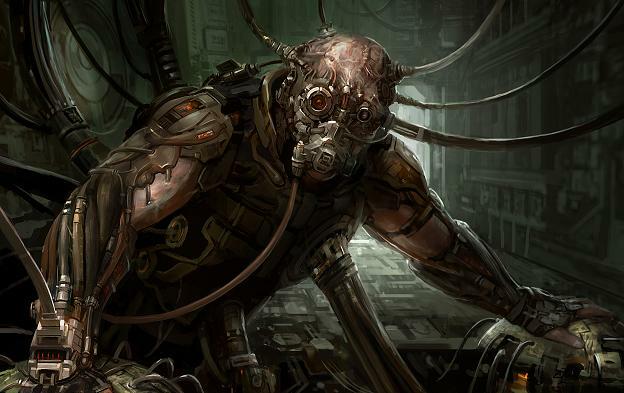 Most of his head was obscured by cybernetic implants: curved, metallic attachments that spread around his skull at every angle, completely concealing his eyes, nose, and mouth. Power and information cables stretched from each implant to somewhere off camera on either side, making it seem like he was suspended in a spider web instead of seated comfortably in a starship in orbit high above the planet. “That sound you’re hearing,” Omvistus replied, “is your planet’s bombardment siren. You’ve probably never had to pay much attention to it in the past, seeing as your world is safely under the jurisdiction of CONCORD, but that is no longer the case.” As he spoke, the back window of the conference room took on a noticeably red tint, saturating the room in crimson light. “What you’re seeing now is the targeting laser used to aim my battleship’s six 425 millimeter railgun turrets. At this altitude, the gravity of your planet will augment the standard launch velocity of each solid projectile to speeds well beyond operational specifications, enough to obliterate anything within half a kilometer of the impact site.” Omvistus’s image grew larger on the screen before he continued. “Anything between that location and two kilometers from ground zero will suffer a worse fate, as the antimatter suspended in each shell escapes its containment field and expands in a random dispersion pattern, colliding with the ambient normal matter on the ground – buildings, trees, children, everything. Whatever these particles touch will experience matter disassociation on an atomic level as, piece by piece, they are reduced to unidentifiable residual particles.” He paused briefly, and then concluded. The red light faded and, for the rest of the afternoon, the capsuleer spoke and the planetary administrator listened with obedience.